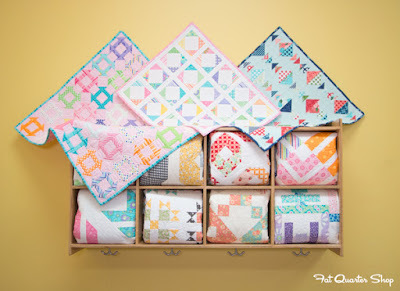 Happy Quilting: Precut Primer Blog Hop!! Well it's the last day of the Precut Primer Blog Hop and that means we must be getting towards the end of of schooling!! Here are some of the facts you need to know for the test :) Precut Primer is written by the oh so amazing duo of Mary Jacobson and Barbara Groves from Me and My Sister Designs!! These ladies are some of the sweetest and most amazing people you will ever meet, and I am so grateful to be able to call them friends!! 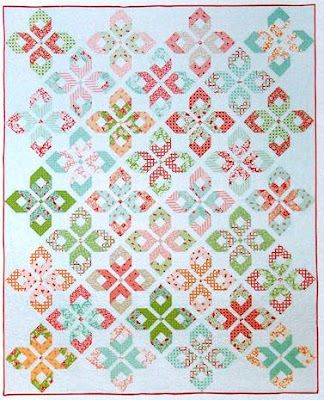 So when my dear friends Mary and Barbara asked if I would like to piece a quilt for their upcoming book earlier this year I was all over it!!! And I was totally drawn to this amazing 11th Grade quilt that I get to share with you today!!! Isn't this just such a gorgeous design!!! I love the way they turned the block on point, gives it a whole new look!!! And the pattern and piecing process is super easy, so even though this is a large quilt, it goes together real fast!! The 11st Grade quilt was hanging at Market so of course, I had to jump in and take a picture with it. I really had so much fun making this quilt!!! And while I did the piecing of the quilt top, it was sent out to Sharon Elsberry to be quilted, and oh my oh my, did she do an absolutely stunning job!!! Just gorgeous!!! And of course, I wanted to make something for the actual Blog Hop itself. I decided to make a mini of the single block, and you know if I am going to make a Mini, it is going to be purple!!! Doesn't the block just look awesome as a mini as well. I love that it even has a 3d effect to it!! Doesn't it just look so cute at the end of my ironing board :) A perfect addition the the purple mini wall!! 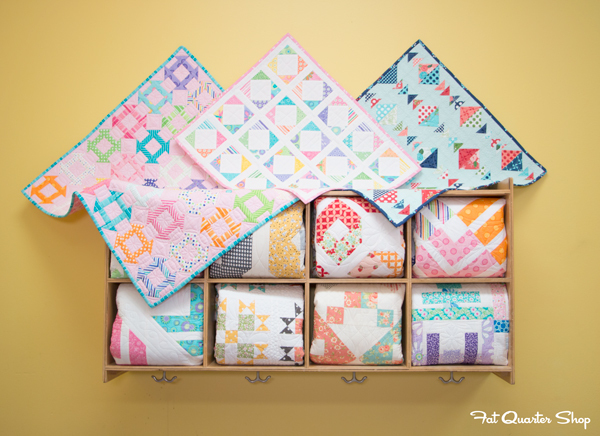 And trust me when I say, each and every quilt is just as adorable as the next!!! Really, there are some amazing designs and because they are all precut friendly, they go together super fast!! Thanks for popping in today!! You all get an A!!!!! Love your purple wall along with all your wonderful quilts. Thanks for sharing all your creativity and talent with all of us. 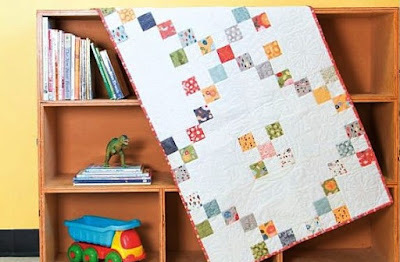 Wow - I really love this quilt- it is gorgeous! I'm really interested in this book - it seems to have fabulous designs. Great job on the color palette you chose - it's really perfect, and thanks for sharing! I'm checkin' out this hop! The mini looks so beautiful! I love using precuts so that book is something I need. There are stunning quilt.The book looks great! I love all of the quilts I have seen on this hop. The quilt is so pretty! I love the colors! Stunning quilt (both the large one and the mini). Especially liking that it's purple. Beautiful quilt! I like the way you made a mini from one block. It looks great in your room. Thanks for sharing your quilts. This has been a great hop. 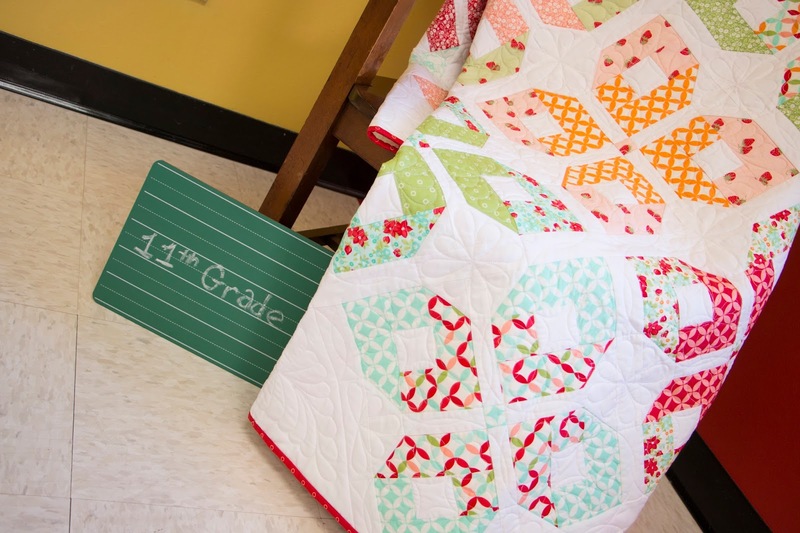 Love the eleventh grade quilt. Is there a tutorial for the 11th grade quilt? It is beautiful! Beautiful, and such a great teacher! Thanks! It is an amazing quilt! I really like your mini quilt also. Purple is my favorite color and your quilt does look spectacular hung up and displayed with your other minis; truly a wonderful idea to adorn your sewing room with quilts that you love. Thank you for sharing and have a wonderful creative day! Love the look of simplicity the white gives. Nice blog hop! Another great, interesting quilt! The new book does look like a winner to me. Your quilts are really gorgeous. This is a gorgeous quilt... love it! Oh very nice. Love the fabrics and the arrangement. Beautiful quilt! Really love the on-point setting! Beautiful. The mini is striking (love that purple wall). Great Quilt!! My Daughter would LOOOVE it...and your other Purple Mini's on your Purple wall too!! :) Beautiful!!! Beautiful quilt. I must get this book. On my Christmas wish list. Love your quilt and your little purple mini. This blog hop was a lot of fun! This is the one I have been waiting to see! I just love the 11th grade pattern! Your purple mini is gorgeous too! love these designs and your fabric choices are beautiful. The quilt is beautiful, and I absolutely love the mini!! Melissa, you did a wonderful job with that quilt! the pattern and colors are so appealing! Sharon did a great job with the quilting too! 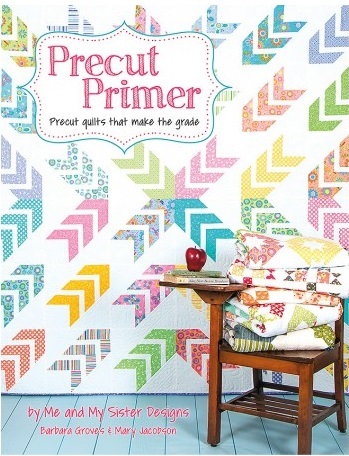 Precut Primer looks like a lot of fun and very handy, considering how much we love precuts. Thanks for your blog posts they give me lots of inspiration.